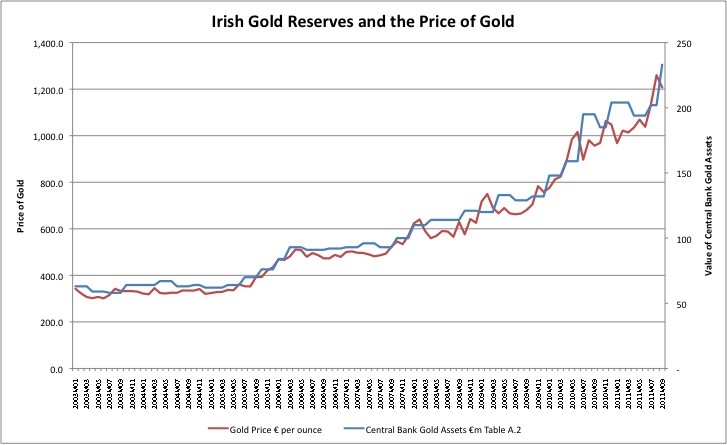 On January 1st 2002 - the day euro notes and coins entered circulation in Ireland and throughout the eurozone - an ounce of gold would have cost you just over €300. Today, as the tenth anniversary approaches, an ounce of gold costs €1300. The chart tells the story - from the excellent World Gold Council website (free registration). 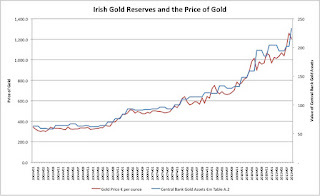 It is quite clear that the value of reserves has moved in lock step with the price of gold - suggesting little net addition or subtraction to the total stock held by the Central Bank. Although curiously, September saw an increase in the value of reserves even as the price actually fell - suggesting a net addition to the stock of reserves. But it's very little, very late. So forget Plan A or Plan B - Ireland needs a Plan G: just in case the eurozone doesn't get to celebrate the tenth anniversary of its launch into circulation.